I've noticed that Hoss like to nest. Blankets, beds - whatever he can get his paws on. Whenever I do laundry, Hoss is right there. 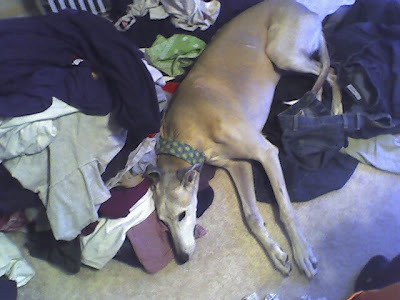 He thinks my sorted piles of clothes are little nests for him. He holds nothing back, and plops right down in the middle. I suppose it is okay - the clothes are already dirty. My only issue is when he starts "fluffing" and messes up my sorted piles!!! I call it a festy nest as I never know what I am going to find in there..shoes/toys/oldbones/knitting...!